DJI’s Ronin-S comes with the Ronin App which offers the CREATE features, among them the ability to make Timelapse and Motionlapse. using the alternative Sony timelapse in-camera app or intervalometers. My setup is using a Sony a6300 camera. Even if not listed in the compatibility list, the a6500 should work the same. a6300 and a6500 are very similar but the a6300 has no IBIS (in-body image stabilization) which is not needed if working with a gimbal. First of all, in order to make remote shutter control work with a Sony camera you must use the RSS-IR cable which is included in the box. It is an Infrared connection that connects to the remote control IR sensor of supported Sony cameras. For other manufacturer’s cameras the Ronin-S can be connected with USB cables that are included in the box. The specific Sony solution with the IR cable is in my opinion a little bit questionable and requires you to point the end of the cable (where the little orange IR light is emitted) precisely towards the camera’s remote control sensor. That alone is a cumbersome process and if you travel and put your gimbal aside between shots you mostly need to re-adjust the RSS-IR cable because it got mis-aligned. Also, I noticed that the IR connection is not working all the time, especially when I used it outdoors in bright sunlight conditions. I don’t know if bright sunlight or reflections distract the IR signal, however, it did not work 100% and was frustrating. On my wish list is that DJI offers a USB-cable connection for Sony cameras OR improves the IR connection. Both is on their list for future development and I hope we don’t have to purchase any extra cables or improved IR cables. Ok, the camera connection is done and so we have the possibility to remote control the camera shutter via the gimbal RECORD button and via the Ronin App (which must be connected to the gimbal via Bluetooth connection). Under CREATE you’ll find Timelapse and Motionlapse. For both you can set the Interval between shots, the frame rate you want to achieve and the duration of you timelapse — these settings will determine how long the timelapse operation will be. For Motionlapse you can also set the planned path of the camera: an initial start orientation and from there you add kind of waypoints and for each you set the camera orientation as you wish. Normal is likely a path from left to right with a little bit of a tilt if that sounds good to you. Basically, it is up to you what your motion path shall be. You need to turn the camera’s AUTO REVIEW ,OFF’ — if you keep it on 2 sec or more you will not get the number of shots done in the time allocated for the timelapse / motionlapse and you end up with less photos than necessary for your timelapse/motionlapse. The theory behind that is that a 1 sec interval will not become reality because every shot frame will require additional 2 seconds (or whatever your review time is) to display, therefore you will end up with only a third of the total frames. AUTO REVIEW OFF is a MUST-HAVE setting – unless your interval is bigger than the AUTO REVIEW setting. Second setting I mostly change is following: I am using MF manual focus instead of Autofocus since every shot would trigger the Autofocus in the camera which is mostly not needed. The camera in my test (A6300) could manage autofocus and was fast enough for a 1 second interval, however, I don’t see a need to use AF. Silent shooting: Even if not necessary, I would use Silent shutter in order to do my timelapse quietly. With these settings Timelapse and Motionlapse worked in my setup. The Sony timelapse app is an add-on you can buy for $10 or so from the Sony Playmemories app store (reachable from their website at https://www.playmemoriescameraapps.com/portal/ or from in-camera). It is kind of an outdated app and not supported for newer camera models like the a7riii, however, for the a6.. series or a7… mark2 series it works. Some people say the app is cumbersome but I disagree, it just works. 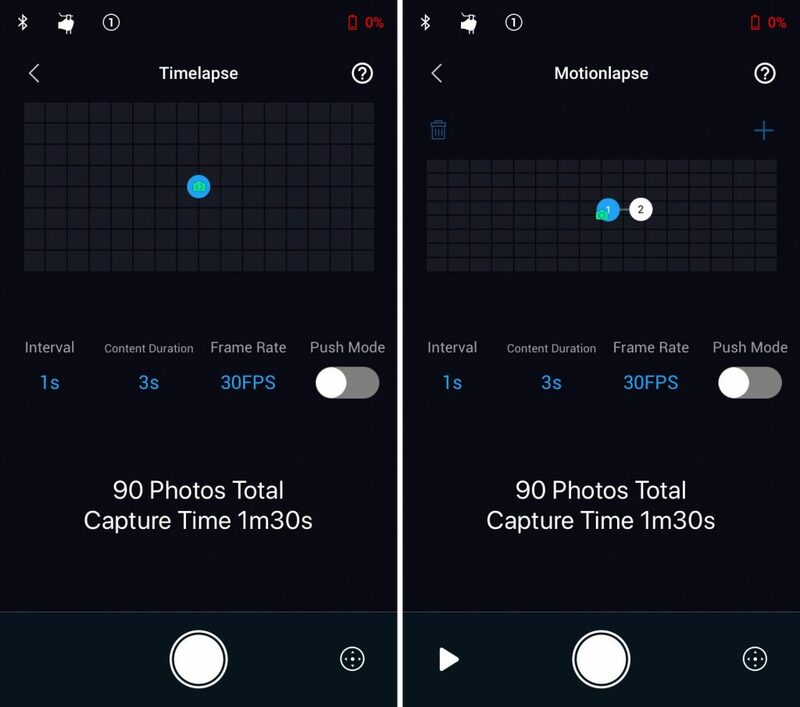 If you use it, I recommend to setup the app to just take Raw images and you assemble the Timelapse yourself – by doing that you work around the app’s limitation to just be able to create 1080p movies. By manually creating the Timelapse you can work with hi-res 24 Megapixel images (6000×4000). In combination with DJI Ronin-S you then just use the Sony app’s settings for a timelapse and the gimbal settings become irrelevant since you use the gimbal basically as a tripod, nothing else (… so you actually don’t need the Ronin-S for that). If you want to do a Motionlapse you’ll need the gimbal’s MOTIONLAPSE path settings and you punch in the same interval, duration, frame rate as you use in the in-camera timelapse settings. The only thing you need to verify is… that your overall duration of the motionlapse (in minutes/seconds) is at least as long as your in-camera timelapse is. 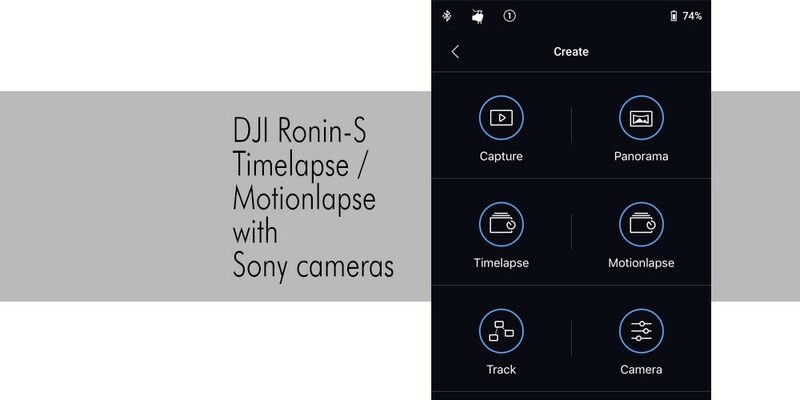 The Ronin-S app MOTIONLAPSE runs for the planned time to complete the motion path. Then it stops. Your in-camera timelapse runs independent. I am not sure if e.g. wireless intervalometers or native in-camera timelapse settings from newer Sony cameras or other manufacturers would go along with the Motionlapse of the gimbal as long as the camera is connected (via the above mentioned cables) to the gimbal because the shutter control is activated and in theory might interfere with the intervalometers shutter control. You could probably disconnect the cable (gimbal to camera) and you loose shutter control, however, the motionlapse feature of the Ronin-S app works even when the camera is off and should just move the Ronin-S along the motion path and the timelapse will be executed by your intervalometer or camera. That is the theory. Let me know if it not the case. Next story Architectural Photography vs. Real Estate Photography — is there a difference?